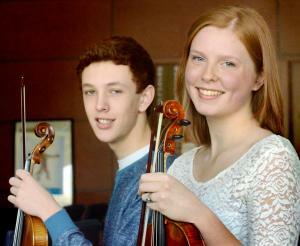 Freshman violinists Rose Crosset and Daniel Friedland were recently featured in a newspaper article published in their hometown newspaper, the York Dispatch. The article charts the students' progression through the orchestra audition process at Penn State. Rose is a graduate of York Suburban High School, and Daniel is a graduate of Dallastown Area High School. They are both violin students of Max Zorin. To read the complete article, click here.